Manufacturing plays a number of key roles in the economy. It offers good wages and excellent benefits to a larger share of workers with less than a college degree than does the rest of the economy. Manufacturing also provides good jobs with excellent wages and benefits to minority workers. Simultaneously, manufacturing employs more than twice as many scientists and engineers, as a share of employment, as does the rest of the economy. Finally, manufacturing is responsible for about two-thirds of private-sector research and development. As a result, manufacturing has historically enjoyed relatively high productivity growth, which has supported high wages and good benefits for its workers. The increase in the U.S. trade deficit with China between 2001 and 2011 eliminated 2.7 million U.S. jobs, over 2.1 million (76.9 percent) of which were in manufacturing. Even when reemployed in nontraded industries (industries that do not involve traded goods), the 2.7 million workers displaced by growing U.S. trade deficits with China lost $13,505 per worker in 2011 alone. For all displaced workers, using education group averages, net wage losses totaled $37.0 billion per year. This wage loss figure is a snapshot of how much more workers displaced between 2001 and 2011 by the growing U.S. trade deficit with China would have earned in 2011 had they not been displaced. It assumes that displaced workers found new jobs in industries unaffected by trade. Annual wage losses will increase if the U.S. trade deficit with China increases (as it did in 2012). Growing U.S. trade deficits with China between 2001 and 2011 displaced a disproportionately large number of good jobs for minority workers—958,800 good jobs with excellent benefits, 35.0 percent of total jobs displaced. Minorities suffered large trade-related wage losses of $10,485 per worker in 2011. For the 958,800 minority workers displaced by growing China trade deficits, net wage losses totaled $10.1 billion per year. There was evidence of racial disparities in the wage data, controlling for differences in education levels. However, the jobs displaced by growing imports paid minority workers more than jobs in nontraded industries: 6.1 percent more for Hispanics, 12.0 percent more for blacks, 35.0 percent more for Asians, 45.5 percent more for “other” minority workers, and 25.5 percent for all minority workers. Growing U.S. trade deficits with China also displaced nearly 1 million (997,700) good jobs with excellent benefits for workers without any college education (36.4 percent of total jobs displaced, and 0.5 percentage points more than their share of the nontraded labor force). In addition, workers with a bachelor’s degree or more education lost 1.057 million jobs, 4.7 percentage points more than their share of the nontraded labor force. The loss of more than 1 million jobs in computer and electronic products between 2001 and 2011 eliminated a net 369,000 good minority jobs (34.7 percent of the jobs displaced in this industry). This was 2.5 percentage points more than the minority share of total U.S. employment (32.2 percent). Wages in the computer and electronic products sector are high, even higher than average manufacturing wages, and therefore they are also higher than wages in nontraded industries. Nearly three-fourths (74.3 percent) of the workers in this industry sector earned wages in the top half of the income distribution. Well over three-fourths (81.1 percent) of the jobs displaced in computer and electronic products by growing China trade deficits required some college or more education, and because of the very high wage premiums in this industry, these losses hit minority workers especially hard. Blacks working in computer and electronic products earned 15.9 percent more and Asians earned 29.4 percent more than workers of the same race/ethnicity in all manufacturing industries; blacks in this industry earned 29.3 percent more and Asians earned 47.9 percent more than workers of the same race/ethnicity in nontraded industries. Wages earned in U.S. industries competing with imports from China were substantially higher than average wages in jobs supported by exports to China. Average weekly wages of jobs displaced by imports from China between 2001 and 2011 were 17.0 percent higher than average wages in jobs supported by exports to China. These wage premiums are likely due in part to education differentials: Jobs displaced by imports from China between 2001 and 2011 had a much greater share of workers with some college or more education (61.9 percent) than jobs supported by exports (52.9 percent), and only 38.1 percent of import-competing workers have a high school degree or less. However, jobs supported by exports did pay 10.3 percent more than jobs in nontraded industries. Under a hypothetical scenario where U.S. exports to and imports from China were each $96.9 billion (the actual value of U.S. exports to China in 2011) but the pattern (the types of jobs lost and gained) is as described in this report, the United States loses $9.9 billion. If exports and imports were $398.5 billion (the actual value of U.S. imports from China in 2011) then the loss is more than four times as much—$40.6 billion. Manufacturing employs a higher share of workers with less than a college degree, and wages and benefits in manufacturing are significantly higher than in the rest of the economy. Nearly half (47.7 percent) of manufacturing workers have a high school degree or less education, 10 percentage points more than workers in all industries (37.6 percent), and nearly 12 percentage points more than in nontraded industries (35.9 percent). Average wages in manufacturing are 16.1 percent higher than average wages in the economy, and 18.4 percent higher than average wages in all nontraded industries. Workers in manufacturing are much more likely to have employer-sponsored health insurance than those employed in other sectors of the economy. More than two-thirds of manufacturing workers (67.8 percent) have employer-sponsored health insurance (ESI), 15.5 percentage points more than the average “strongly attached” private-sector worker in the total workforce (only 52.3 percent of such workers have ESI benefits). Scientists and engineers make up 7.8 percent of manufacturing workers, nearly 2.4 times the average science and engineering share in the rest of the economy (3.3 percent). This report begins with an analysis of averages wages for manufacturing and other workers, by level of education and by race and ethnicity (Tables 1­­ through 3), and concludes that manufacturing jobs offer high wages for workers with all levels of education and for different racial and ethnic groups. It then compares employment of scientists and engineers in manufacturing with other sectors of the economy (Table 4). This section concludes with a review of other benefits of manufacturing for the economy at large. Having established the important role played by manufacturing, the report then turns to an examination of the effects of trade on employment and wages paid in the economy. This analysis begins with a summary of jobs gained and lost due to growing trade deficits with China between 2001 and 2011 (Table 5). It then calculates average wages paid in export and import industries by education (Table 6) and racial and ethnic group (Table 7). Net jobs displaced by race and ethnicity are derived from Table 7 and provided in Table 8. The paper then compares the gains and losses in goods-traded industries with average wages available in the rest of the economy, assuming workers are reemployed elsewhere in nontraded industries (Table 9). The paper concludes with an examination of trade and wages in one particularly important sector, the computer and electronic products industry and the effects of trade in this sector (Table 10), including a comparative analysis of the distribution of employment (Table 11) by different wage strata (bottom fifth, next 30 percent, and three groups in the top half of the wage distribution, ending with the top 10 percent). Trade in computer and electronic products has had a disproportionately large impact on gains and losses associated with trade because of the large numbers of jobs displaced by China trade in this particular sector, and because wages in this sector are especially high. Traditional “Ricardian” trade theory argues that all countries gain from trade by specializing in the production of goods in which they have a comparative advantage (Krugman and Obstfeld 1991). Bivens (2013) has shown that while the nation as a whole may gain from trade, the benefits are concentrated among college educated and nonproduction and supervisory workers, and in rising returns to capital. The United States has experienced rapidly growing wage and income inequality over the past three decades (Mishel et al. 2012). Bivens (2013) has shown that growing trade with less developed countries (LDCs), and with China, in particular, has been responsible for large shares of the rapidly growing college-noncollege wage gap. That overall wage gap increased 22.0 percentage points between 1979 and 2011. Growth of LDC trade was responsible for one-third of the increase in U.S. income inequality in this period, and growing trade with China, alone, was responsible for nearly half of the increase in all LDC trade with the United States (Bivens 2013, Table 1). This microeconomic competition is purely determined by the amount of U.S. trade with China and other countries. It is independent of bilateral or global trade balances. In fact, the United States could have a trade surplus with China and still face downward pressure on wages due to indirect wage competition between Chinese and American workers. This paper evaluates the macroeconomic effects of growing U.S. trade deficits with China on the wages of workers directly affected by changing trade flows. Growing trade with China has increased U.S. exports to and imports from China. In this paper we look at the average wages paid to workers in traded-goods industries, and estimate the wage gains or losses associated with changes in trade flows and in trade-related employment. The analysis begins with an examination of average wages for each demographic group for various groups of industries including all workers employed in manufacturing industries. Most traded goods are manufactured products, and average manufacturing wages are similar to wages in goods trade with China, as shown below. The analysis then considers other aspects of manufacturing employment and production. The paper then turns to the examination of the effects of China trade on wages paid to U.S. workers. It is important to note that the wage effects identified in this paper are purely the result of between-industry shifts in trade-related employment. Trade is also changing the composition of employment within industries. Though such within-industry shifts are not assessed in this report, they may mitigate some of the job losses among highly educated workers in many of the industries included in this study, especially the computer and electronic products industry, which has an especially important impact, as shown below. Bivens (2008) presents evidence and analysis and reviews literature showing that trade has increased the demand for college-educated labor within certain industries. Bivens’s analysis suggests that trade within industries such as computer and electronic products likely involves substantial “vertical specialization” in production, with labor-intensive activities such as computer assembly being shifted abroad while more skill- and capital-intensive activities such as semiconductor design and production of advanced integrated circuits are taking place in the United States. Such within-industry shifts can increase the demand for college-educated labor at home, relative to demand for workers with less education. Thus, the wage loss estimates in this report assume that growing trade deficits have proportionate impacts on workers from all educational groups. To the extent that growing trade deficits have been associated with “within industry” shifts and have fallen most heavily on noncollege educated workers, the estimates in this report will represent an upper-bound on trade-related job losses. Average levels of employment and weekly wages by education level for all industries and for manufacturing are shown in Table 1. Manufacturing is a key employer of workers with a high-school degree or less education: In manufacturing, such workers hold a larger share of jobs than they do in the economy as a whole (47.7 percent in manufacturing vs. 37.6 percent in all industries). Most traded goods—including goods traded with China—are manufactured products. For example, 82.1 percent of U.S. imports and 87.0 percent of U.S. domestic exports in 2012 were traded goods (U.S. International Trade Commission 2013). In 2011, about 97.8 percent of U.S. imports from and 66.7 percent of U.S. exports to China were manufactured goods (U.S. International Trade Commission 2013). Thus, trade is particularly important for manufacturing. Note: Average wages by education group are from a 3-year pooled sample of workers by industry from 2009–2011. 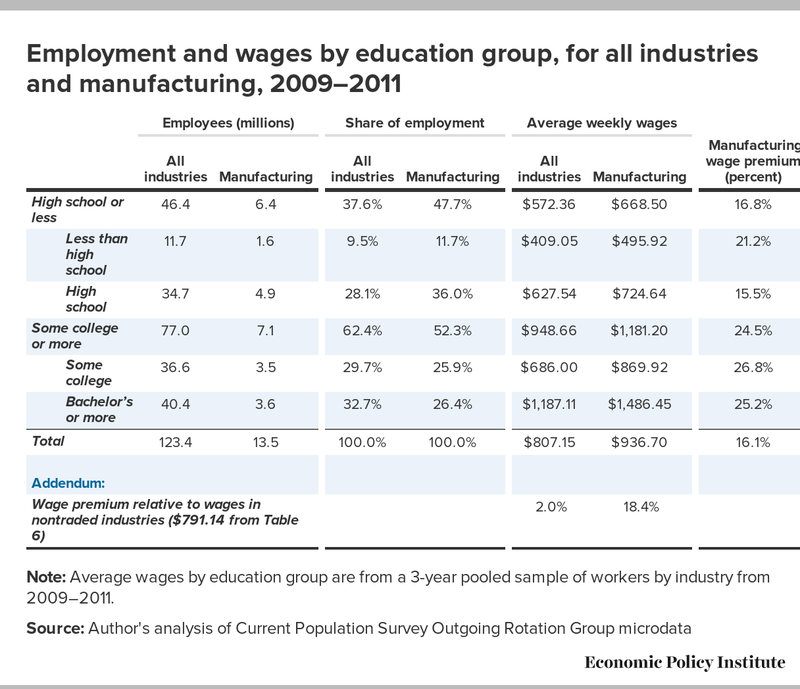 Manufacturing also pays comparatively high wages, for each class of worker (by education), as shown in Table 1. Average weekly wages for all industries and for manufacturing are shown in data columns 5 and 6 of Table 1.4 Manufacturing wage premiums—the percent extra earned by working in manufacturing rather than in any industry, shown in column 7, range from a low of 15.5 percent for high-school educated workers to 26.8 percent for workers with some college, with an average manufacturing wage premium for workers across education levels of 16.1 percent. The manufacturing wage premium relative to nontraded industries (that is, the percent extra earned by working in manufacturing rather than in nontraded industries) is 18.4 percent (as shown at the bottom of Table 1). Average wages in nontraded industries will be used as a benchmark for estimating the cost of jobs lost due to growing China trade deficits, later in this analysis. Thus, manufacturing employs a higher share of workers with less than a college degree, and wages and benefits in manufacturing are significantly higher than in the rest of the economy. Wages in the manufacturing sector are above average because manufacturing is a high-productivity, capital-intensive sector. Unionization rates are higher in manufacturing (10.5 percent in 2012) than in the private sector as a whole (7.3 percent), reflecting labor’s greater bargaining power in manufacturing, compared with other sectors of the economy (BLS 2013b). In addition, workers in manufacturing are much more likely to have employer-sponsored health insurance (ESI) than those employed in other sectors of the economy. More than two-thirds of manufacturing workers (67.8 percent) have employer-sponsored health insurance, 15.5 percentage points more than the average “strongly attached” private-sector worker (only 52.3 percent of such workers have ESI benefits), another measure of the excellent wages and benefits paid to manufacturing workers (Gould 2012, Tables 3 and 9). Employment and wages by race and ethnicity are reported in Table 2. The employment picture for minority groups as of 2009–2011 is mixed. For some minority groups, manufacturing employment shares (data column 4) were below their shares of the total employed population (column 3). Black workers constituted 11.0 percent of the labor force, but only 8.8 percent of the manufacturing workforce, 20 percent less than their average share of the employed population (column 7). Likewise, the employment share of minorities in the “other” group was 25.3 percent below their share of the employed population, but for this group both employment shares were less than 2.0 percent and the samples sizes were quite small. Note: The white, black, Asian, and "other" race categories exclude Hispanics; the Hispanic ethnic designation includes individuals of any race. Average wages by race and ethnicity are from a 3-year pooled sample of workers by industry from 2009–2011. In contrast, Hispanic and Asian workers had above-average employment shares in manufacturing. Hispanic workers made up 15.6 percent of the manufacturing labor force, 7.0 percent more than their share of the total employed population (14.6 percent). Asian workers made up 5.7 percent of the manufacturing labor force, 21.1 percent more than their 4.7 percent share of the total labor force. Manufacturing jobs are good jobs, because they pay high wages, and both Hispanics and Asians earn higher wages in manufacturing than in the economy as a whole. At first glance, it appears that Asians enjoy a much higher manufacturing wage premium than Hispanics. The average manufacturing wage premium for Hispanic workers in 2009–2011 was only 3.5 percent (column 8), while Asian workers in manufacturing earned an average wage premium of 12.1 percent, nearly four times larger. 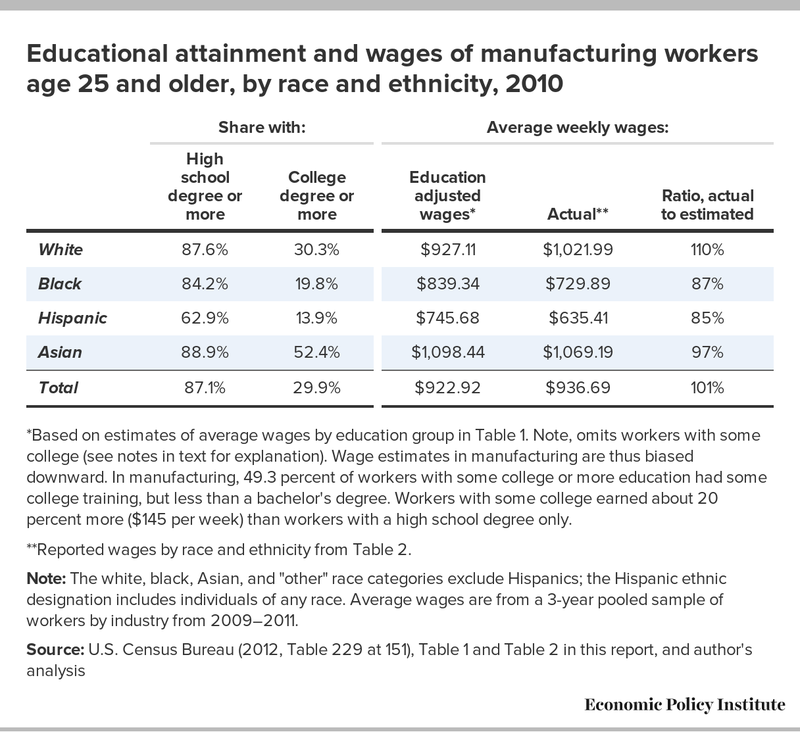 The difference between wage premiums of Hispanic and Asian manufacturing workers is explained, in part, by their very different educational profiles, as shown in Table 3. In 2010, only 62.9 percent of Hispanic manufacturing workers had at least a high school degree, less than black (84.2 percent), white (87.6 percent), and Asian manufacturing workers (88.9 percent). Achievement gaps are much greater at the college graduate level. In 2010, only 13.9 percent of Hispanic workers had a college degree or more education, compared with 19.8 percent of blacks, 30.3 percent of whites, and 52.4 percent of Asians. *Based on estimates of average wages by education group in Table 1. Note, omits workers with some college (see notes in text for explanation). Wage estimates in manufacturing are thus biased downward. In manufacturing, 49.3 percent of workers with some college or more education had some college training, but less than a bachelor's degree. Workers with some college earned about 20 percent more ($145 per week) than workers with a high school degree only. **Reported wages by race and ethnicity from Table 2. Note: The white, black, Asian, and "other" race categories exclude Hispanics; the Hispanic ethnic designation includes individuals of any race. Average wages are from a 3-year pooled sample of workers by industry from 2009–2011. Differences in educational attainment help explain differences in the manufacturing wage premiums by race. Although not shown in table 3, more than one-third of Hispanics (37.1 percent) have less than a high school degree. Workers with less than a high school degree earned only $495.92 per week in manufacturing. Employment of Hispanics is concentrated in industries such as food processing, and many of those employees have less than a high school education. Table 2 showed a wide variance in the manufacturing wage premiums, ranging from 3.5 percent for Hispanics, to 10.4 percent for blacks, to 12.1 percent for Asians, to 18.2 percent for whites. These data appear to suggest a broad pattern of racial disparities in minority wages, especially considering the high rates of workers with at least a bachelor’s degree in the Asian labor force. This theory is tested by developing rough estimates of education-adjusted manufacturing wage premiums in the third column of Table 3. These are compared with actual, observed premiums for the four largest demographic groups, and for all workers, in columns 4 and 5 of Table 3. The results of the simulation do suggest that there is a pattern of racial disparities in manufacturing wages.6 Simulated wages in column 3 are compared with actual wages in column 4. The data in column 4 show that actual wages for Hispanics were about 15 percent less than the education-adjusted estimates, and actual wages for black workers were about 13 percent less than the education-adjusted wages. Actual wages for white workers were about 10 percent above the predicted levels, so the gap between white and Hispanic and black workers is in the range of 23 percent to 25 percent. The simulation also suggests that differences in educational attainment are largely responsible for the gap between the actual wage premiums earned by Hispanic workers (3.5 percent, Table 2) and black workers (10.4 percent). Most of this gap disappears in the simulated wage ratio in column 5 in Table 3, where both Hispanic and black workers earned about 85 percent to 87 percent of their simulated, education-adjusted wages. Despite the evidence of racial disparities in manufacturing wages for most minorities, manufacturing still remains an important source of good jobs with excellent benefits for all minorities. As shown in Table 2, minority workers earn wage premiums of 3.5 percent to 12.1 percent for the largest minority groups, and an even larger 22.1 percent for a small number (190,000) of other minorities. Overall, manufacturing jobs offer an average wage premium of 16.1 percent relative to all industries, and offer minorities a wage premium of 9.5 percent. In addition to offering excellent wages and benefits, especially to workers with a high-school degree or less education, manufacturing also generates a number of other benefits for the domestic economy. Although manufacturing was responsible for only 11 percent of U.S. GDP in 2011, it generated more than two-thirds (68 percent) of all research and development (R&D) by domestic companies (Rothwell and Wial 2012). Thus, manufacturing has an outsized footprint in the domestic economy. According to Rothwell and Wial (2012), manufacturing R&D generated an estimated social return to the nation as a whole of up to 30 percent.7 R&D generates large spillover benefits that cannot be completely captured by innovators, and that spur growth in the economy at large. Manufacturing is also a very important employer of scientists and engineers. 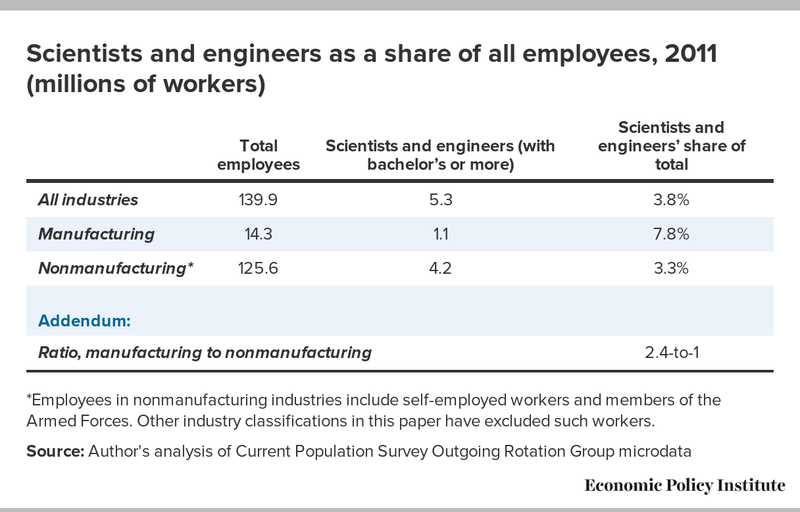 Although the share of workers with a bachelor’s degree or more education (BA+ workers) is smaller in manufacturing overall than the economy as a whole (Table 1), scientists and engineers made up 7.8 percent of manufacturing workers, more than twice as high (nearly 2.4 times as high) as the average science and engineering share of workers in the rest of the economy (3.3 percent), as shown in Table 4. In 2011, there were 1.1 million BA+ scientists and engineers employed in manufacturing (7.8 percent of total employees), and only 4.2 million out of a total 125.6 million (3.3 percent) employed outside of manufacturing. Furthermore, 35 percent of all engineers worked in manufacturing (Rothwell and Wial 2012). *Employees in nonmanufacturing industries include self-employed workers and members of the Armed Forces. Other industry classifications in this paper have excluded such workers. In 2011, scientists and engineers made up 7.8 percent of manufacturing workers, more than twice as high (nearly 2.4 times as high) as the average science and engineering share of workers in the rest of the economy (3.3 percent). Many observers (e.g., Romer 2012) cite the decline in manufacturing as a share of total U.S. nonfarm employment (which fell from 25.1 percent in 1970 to 8.9 percent in 2011 and 2012) as an indicator of its small role in overall job creation.9 But that argument fails to take into account the number of jobs supported by manufacturing production in industries ranging from agriculture to accounting and legal services. Forty years ago, General Motors Corp. and other large manufacturing companies employed many more accountants, lawyers, and other professionals in-house. Over time, they have found it more profitable to outsource those activities to external service providers who sell their services to GM and other manufacturers. But just because those transactions now take place at arms-length does not mean that those jobs in commodity and service industries are not directly supported by manufacturing production. And the vast majority of such “outsourcing” over the past 40 years has been to domestic firms. The total U.S. manufacturing trade deficit in 2012 was only 4.4 percent of U.S. GDP.10 Reducing or eliminating the U.S. trade deficit could support millions of new U.S. jobs in manufacturing and other supplier industries. Because the United States has excess unemployment and is operating far below capacity, shrinking the deficit would have a multiplier effect on employment, GDP, and the economy (Scott, Jorgensen, and Hall 2013). But that does not change the fact that many of the manufacturing jobs displaced over the past four decades have simply been transferred to service firms elsewhere in the economy. But for that domestic outsourcing, domestic manufacturing would have continued to grow with the economy, and its share of employment in the domestic economy would have remained roughly stable, or declined at a much slower rate than it actually did. The fact remains that manufacturing plays a central role in the domestic economy. It is responsible (directly and indirectly) for approximately 40 percent of total domestic output and employment, it supports a disproportionately large share of total R&D in the economy, and it employs much larger shares of scientists and engineers than other sectors of the economy. The research that manufacturers produce generates very high rates of productivity growth, which is diffused throughout manufacturing and the economy, and which has been responsible for a significant proportion of the overall growth of the U.S. economy for decades. Although the share of manufacturing in the domestic economy has declined significantly in the past four decades, the number of manufacturing workers employed was roughly constant, ranging between 16 million and 19 million between 1979 and 1998. Since April 1998, 5.7 million manufacturing jobs have been lost (through June 2013), a decline of 32.2 percent (BLS 2013a). The growth of international outsourcing, and of the manufacturing goods trade deficit in particular, has been responsible for a large share of those job losses. Two of the most important events in that period were the Asian financial crisis of 1997–1998, and China’s entry into the World Trade Organization in 2001.11 The Asian financial crisis was followed by a period of widespread currency manipulation by a group of 20 or more foreign nations that has increased the U.S. trade deficit by $200 to $500 billion (Bergsten and Gagnon 2012). China is one of the leading currency manipulators in the world, and has also engaged in widespread repression of labor rights, dumping, subsidies, and a host of other unfair trade practices that have combined to give it a huge and unfair advantage in trade with the United States and other nations (Scott 2012). The remainder of this paper will examine the impacts of China trade on U.S. employment and wages. As a result of China’s currency manipulation and other trade-distorting practices (including extensive subsidies, legal and illegal trade barriers, dumping, and suppression of wages and labor rights), the increase in foreign direct investment in China and related growth of its manufacturing sector, and the absence of a growing market for U.S. consumer goods in China, the U.S. trade deficit with China rose from $84.1 billion in 2001 to $301.6 billion in 2011, an increase of $217.5 billion, as shown in Table 5 (Scott 2012). Since China entered the WTO in 2001, this deficit has increased annually by $21.7 billion, or 13.6 percent, on average. *Domestic exports are goods produced in the United States and exclude re-exports, i.e., goods produced in other countries and shipped through the United States. Total exports as reported by the U.S. International Trade Commission include re-exports. Total exports were estimated to be $103.9 billion in 2011, and U.S. re-exports to China represent 6.72 percent of total exports. The employment estimates shown here are based on domestic exports only. See Scott (2012, endnote 9) for additional details. Despite the collapse in world trade between 2008 and 2009 caused by the Great Recession, the U.S. trade deficit with China increased $31.2 billion between 2008 and 2011. In that period, the U.S.-China trade deficit’s share of the overall U.S. trade deficit increased from 32.6 percent to 40.8 percent, and its share of the total U.S. non-oil trade deficit jumped from 69.6 percent to 77.7 percent (these data are not in the table but from the author’s analysis of U.S. International Trade Commission 2012). The effects of trade on employment were estimated in Scott (2012). Data on the effects of trade on employment by industry, for each of 44 industries in 2001, the year before China’s entry into the World Trade Organization began to have an impact, and in 2011, the most recent year for which complete trade and employment data were available, were used to estimate the macroeconomic effects of changes in the trade balance on worker wages by education and race/ethnicity. When analyzing the effects of trade on employment, the issue is simple: Increased exports support U.S. jobs and increased imports cost U.S. jobs (Scott 2013). Thus, it is trade balances—the net of exports and imports—that determine the number of jobs created or displaced by trade agreements. Unless trade deals such as the agreement to bring China into the WTO in 2001 promise to reduce the U.S. trade deficit, they will not have a net positive effect on U.S. employment. Rather than reducing trade deficits, past trade deals have actually been followed by larger trade deficits (Scott 2013). Where C is consumer spending, I is investment spending, G is government purchases of goods and services, X is exports, and M is imports. While trade agreements lead to higher X, they also lead to higher M, Krugman wrote. Exports support demand for domestically produced goods, so higher X increases employment. However, the growth of imports reduces demand for domestically produced goods, which reduces domestic employment. 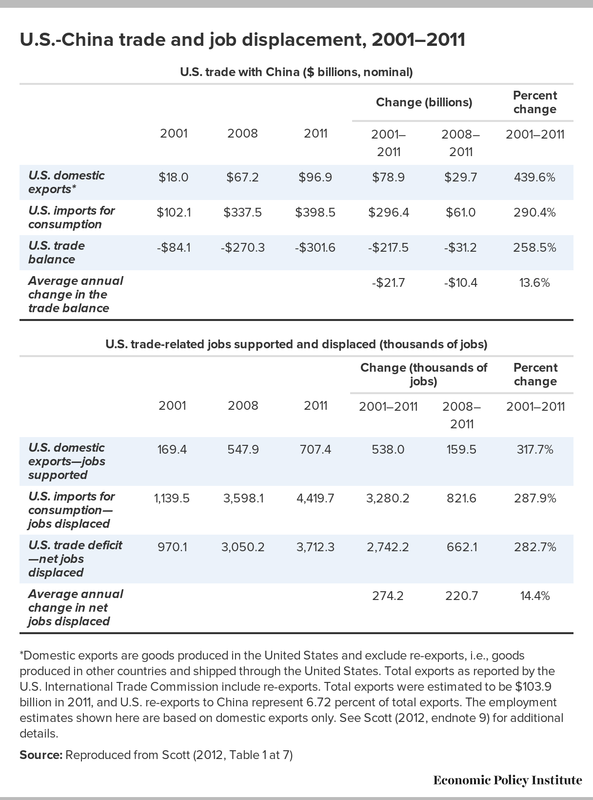 Changes in exports to and imports from China between 2001 and 2011, and their implications for total U.S. employment, are shown in Table 5. Each $1 billion in exports to China from the United States supports some American jobs. However, each $1 billion in imports from China displaces the American workers who would have been employed making these products in the United States. The net employment effect of trade depends on the changes in the trade balance. An improving trade balance can support job creation, but growing trade deficits usually result in growing net U.S. job displacement. The United States has had large trade deficits with China since 2001, which increased in every year except 2009, when U.S. trade with all countries collapsed due to the recession of 2007–2009. The employment impacts of the growing U.S. trade deficit with China were estimated using an input-output model that estimated the direct and indirect labor requirements of producing output in a given domestic industry. The model included 195 U.S. industries, 77 of which were in the manufacturing sector. See Scott (2012) for details on model structure and data sources. The model estimates the amount of labor (number of jobs) required to produce a given volume of exports and the labor displaced when a given volume of imports is substituted for domestic output.13 The difference between these two numbers is essentially the jobs displaced by growing trade deficits, holding all else equal. Jobs displaced by the growing China trade deficits are a net drain on employment in trade-related industries, especially those in manufacturing. Even if increasing demand in other sectors absorbs all of the workers displaced by trade (which is unlikely), job quality likely suffers because many nontraded industries such as retail and home health care pay lower wages and have less comprehensive benefits than traded-goods industries, as shown in this report. U.S. exports to China in 2001 supported 169,400 jobs, but U.S. imports displaced production that would have supported 1,139,500 jobs, as shown in the bottom half of Table 5. Therefore, the $84.1 billion trade deficit with China in 2001 displaced 970,100 jobs in that year. Job displacement rose to 3,712,300 jobs in 2011. Since China’s entry into the WTO in 2001 and through 2011, the increase in the U.S. trade deficit with China eliminated or displaced 2,742,200 U.S. jobs, as shown in the bottom half of Table 5. Rising trade deficits have displaced a growing number of jobs every year since China joined the WTO, with the exception of 2009 (during the Great Recession). The U.S. trade deficit with China increased by $31.2 billion (or 11.6 percent) between 2008 and 2011, and the number of jobs displaced increased by 21.7 percent. Meanwhile, the U.S. trade deficit with the rest of the world declined 19.3 percent between 2008 and 2011 (according to the author’s analysis of U.S. International Trade Commission 2012). These figures illustrate the damage done when China took advantage of the Great Recession to expand its beggar-thy-neighbor trade policies14 through currency manipulation and other illegal and unfair trade policies, which undermined job creation in the U.S. economy throughout the downturn, benefiting China at the expense of the United States and China’s other trading partners. Between 2008 and 2011 alone 662,100 jobs were lost due to growing trade deficits with China, either by the elimination of existing jobs or by the prevention of new job creation (Table 5). On average, 274,200 jobs per year have been lost or displaced since China’s entry into the WTO (Table 5). The continuing growth of job displacement between 2008 and 2011 despite the relatively small increase in the trade deficit reflects the relatively rapid growth of U.S. imports of computer and electronic products from China, and the fact that the price index for most of these products fell continuously throughout the study period. The share of U.S. imports from China accounted for by computer and electronic products (in current, nominal dollars) increased from 32.9 percent in 2008 to 37.4 percent in 2011 (according to the author’s analysis of U.S. International Trade Commission 2012). Detailed data on the employment impacts by industry of growing trade deficits with China from 2001 to 2011 are used below to estimate the impacts of growing U.S. trade deficits with China on wages and employment by education and for different minority groups. The effects of growing U.S. trade deficits with China by education group are shown and analyzed in Table 6. The data reported in the table reflect the effects of three macroeconomic forces. The first three data columns show the effects of the growth of imports from China between 2001 and 2011 by education group. The next three columns show the effects of growing U.S. exports to China, by education group. The final three columns show the distribution of a comparable group of workers in nontraded industries (this group excludes all manufacturing industries and other commodity sectors involved in trade, including agriculture, forestry, and mineral products). The dataset covered about 123 million public and private sectors workers (Current Population Surveys, various years). The data exclude members of the armed forces, private households, and a few minor, miscellaneous industries that could not be matched to sectors as tracked by the U.S. Bureau of Labor Statistics (see endnote 4). Detailed data on the employment effects of trade for each of 45 aggregated industries in our model, and average wages paid in those industries, were used to estimate the impacts of trade by education group.15 The distribution of employment by education group for each of those 45 industries was used to estimate the effects of changes in trade on employment. This education and wage information was combined with estimates of the numbers of jobs created or displaced by trade by industry (Scott 2012, Table 3 and pages 15–16) to estimate the impacts of changes in trade by education group and on average wages. Thus, for example, workers with less than a high school degree made up 24.0 percent of 1.58 million workers in the food and kindred products industry on average in the 2009–2011 period. Growing imports from China displaced 15,700 workers in this industry between 2001 and 2011. Assuming that workers were displaced in proportion to industry representation, we estimated that 3,800 workers with less than a high school (LTHS) degree were displaced by growing China trade deficits in this industry. Using similar procedures, and summing over all industries, we estimated that growing imports from China displaced a total of 349,900 LTHS workers between 2001 and 2011, as shown in the first data column of Table 6. Similar calculations were carried out for workers with high school education, some college, and a bachelor’s degree or more education, for both imports and exports, with the results shown in columns 1 and 4. The numbers of workers were summed, and the shares of each education class were calculated and reported in columns 2 and 5. Comparison data for nontraded industries are reported in columns 6–9 and are discussed below. Average weekly wages for each type of work (by education) were estimated for each industry, then combined with the number of workers displaced in each industry to estimate industry/employment weighted average wages by education level. These averages are reported in columns 3, 6, and 9 of Table 6. Weighted, average total wages, using the overall employment shares of each education group, are reported in bold at the bottom of columns 3, 6, and 9. One of the most remarkable findings is that wages of jobs displaced by imports from China, which averaged $1,021.66 per week, were $148.77 per week (17.0 percent) higher than average wages in industries exporting to China. However, jobs supported by exports did pay 10.3 percent more than jobs in nontraded industries. These results show that in trade with China, the United States is trading down: Wages earned in U.S. industries competing with imports from China are substantially higher than average wages in jobs supported by exports to China. Not only do import-competing industries pay more than industries exporting goods to China, but import-competing industries are also more skill intensive, as measured by the average education levels of the jobs displaced by imports. As noted in the top row of Table 6, workers with a high school degree or less education constitute only 38.1 percent of workers displaced by imports from China. Put differently, 61.9 percent of the jobs displaced by imports require some college, or more education, compared with 52.9 percent of jobs supported by exports. These findings contradict the predictions of standard neoclassical trade theory, which argues that the United States should specialize in exporting high-wage, and skill-intensive products, and that we should be importing low-skill, labor-intensive products. Neither theoretical assertion is supported by the data. These results are based on the strong assumption, noted earlier, that job displacement within industries has a proportionate impact on workers from each educational class. If, however, more jobs requiring lower levels of education are being offshored within each industry, then the education gap between jobs displaced by imports and jobs supported by exports could be smaller. Jobs supported by exports are more similar to the manufacturing profile shown in Table 1. Nearly half (47.1 percent) of the jobs supported by exports to China went to workers with a high school degree or less education. This is nearly identical to the 47.7 percent share of manufacturing jobs going to these same workers (Table 1). The data in Table 6 can also be used to calculate net jobs lost by educational group due to growing trade deficits (by subtracting the jobs supported by exports from the jobs displaced by imports). Growing U.S. trade deficits with China displaced nearly 1 million (997,700) good jobs with excellent benefits for workers without any college education (36.4 percent of total jobs displaced, and 0.5 percentage points more than their share of the nontraded labor force). In addition, workers with a bachelor’s degree or more education lost 1.057 million jobs (38.5 percent of total jobs displaced, 4.7 percentage points more than their share of the nontraded labor force). Thus, growing China trade deficits displaced disproportionately large numbers of workers at both the top and the bottom of the educational ladder. It is true that both import-competing and export-supported jobs in U.S.-China trade paid substantially more than the average job in nontraded industries. Import-competing jobs paid 29.1 percent more than jobs in nontraded industries, overall. Jobs supported by exports paid less than import-competing jobs, as noted earlier. However, jobs supported by exports paid 10.3 percent more than jobs in nontraded industries. In addition, there was a substantial traded goods premium at every level of education, both for jobs displaced by imports and jobs supported by exports, relative to nontraded industries. The very high level of average wages in import-competing industries, and the very large number of jobs displaced by the growth of imports (3.3 million, as shown in Table 5), compared with the lower level of wages supported and the much smaller number of jobs supported by the growth of exports to China (538,000) implies that trade with China had large macroeconomic costs for the United States, above and beyond the costs of the millions of jobs lost and displaced. These costs will be presented later in the report in Table 9. Comparable data on the effects of China trade by race and ethnicity are discussed in the next section. The effects of growing China trade by race and ethnicity are shown and analyzed in Table 7. As in Table 6, the data reflect the effects of three macroeconomic forces: exports, imports, and nontraded goods (the reference group). In each set of columns, data are reported for the number of jobs supported or displaced for each of five racial and ethnic groups: white, black, Hispanic, Asian, and other minorities, along with the total number of minority and all workers affected. For example, the first column shows the number of jobs displaced by imports for all minority groups and for each racial and ethnic group, the second column shows each group’s share of total workers displaced, and the third column shows the weighted average weekly wages paid to workers in each group. Black and “other” minority workers (the residual, less than 2 percent of all), as well as white workers were underrepresented in both jobs supported by exports and jobs displaced by imports; their shares of these jobs were less than their shares of the overall workforce, as shown in Table 2, and less than their shares of jobs in nontraded industries. 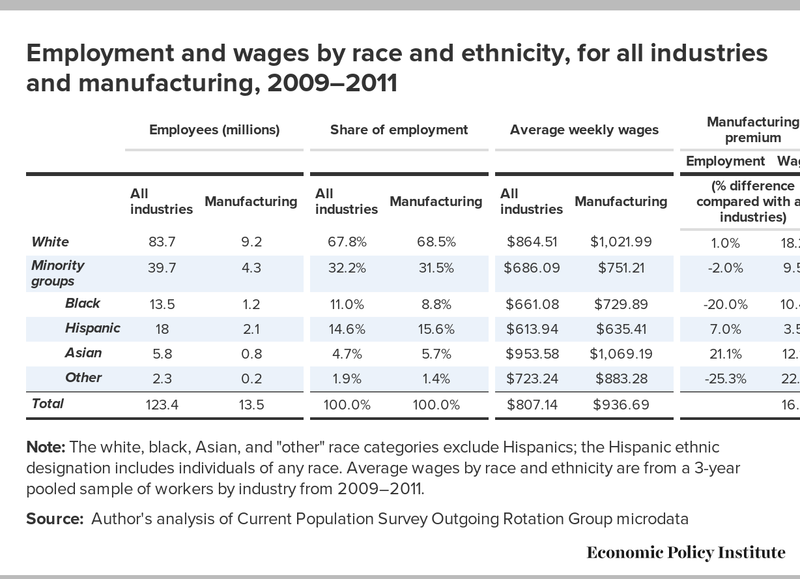 For blacks and other minority workers, this largely reflects the fact that they tend to be underrepresented in manufacturing industries, also shown in Table 2. The degree of revealed racial wage disparity, in terms of employment shares, tends to be much higher for blacks than for whites or most other minority groups, as shown in Table 7. The black employment share of jobs displaced by imports from China was 2.8 percentage points less than their share of nontraded employment, and this 2.8-percentage-point gap constituted 24.6 of the black share of the nontraded industries labor force. For white workers, the difference was 2.6 percentage points, but that is only 3.8 percent of their share of the overall nontraded industries workforce. The displacement of manufacturing jobs for black workers is partly a domestic phenomenon, because U.S. manufacturing plants have, over the past “several decades, been moving out of the dense, centrally located metropolitan counties…” (Helper, Krueger, and Wial 2012). The movement of the auto industry out of Detroit, in particular, has had a large negative impact on African American employment in auto and auto parts manufacturing, which has, in turn, a large effect on total minority employment in manufacturing. Nonetheless, it is still true that growing trade deficits with China have displaced a large number of good jobs for African Americans and other minorities, and also for white workers. Hispanics and Asians were disproportionately affected both by the growth of imports from and exports to China. The Hispanic share of jobs displaced by growing imports from China was 15.3 percent, 1.1 percentage point (7.6 percent more) than their 14.2 percent average share of employment in nontraded industries. Minorities overall were disproportionally affected by the growth of imports from and exports to China, relative to their share of overall employment and employment in nontraded industries. Growing imports from China had a much larger, negative impact on Asians than on other minority groups. Asian workers’ share of jobs displaced (9.4 percent) was more than twice (103.5 percent larger) than their 4.6 percent share of the labor force in nontraded industries. Manufacturing overall does not employ such a disproportionately large share of Asians (5.7 percent, as shown in Table 2). The large, negative impact of imports from China on Asian employment is explained by the large share of jobs displaced in computer and electronic products, which will be explored below. Both facts are also closely related to the high share of Asians with a bachelor’s degree or more education (Table 3), and such workers are intensively employed in the computer and electronic products industry. Both export- and import-competing industries pay higher than average wages in nontraded industries, for every racial and ethnic group, and minorities as a group, as show in columns 3, 6, and 9 of Table 7. However, the wage premiums (columns 3 and 6 minus column 9) were much larger for jobs displaced by imports, another indicator that trade with China stands the principle of comparative advantage on its head—the United States is specializing in exporting lower-wage products than are displaced by imports from China, for every racial and ethnic group. As noted earlier, manufacturing (which makes up the bulk of traded goods jobs) is also an excellent source of good jobs for minority groups. The rapid growth of jobs-displacing imports from and the trade deficit with China displaced a disproportionately large number of excellent jobs for minority groups. As shown in Table 7, on the import side, the highest wage premiums (column 3 minus column 9) were earned by Asian workers ($327.80 per week or 35.0 percent) and other minorities ($320.85 or 45.5 percent), relative to wages in nontraded industries. White workers would have earned $267.48 per week (31.7 percent) more in jobs displaced by imports from China. Blacks would have earned $78.32 per week (12.0 percent more) and Hispanics would have earned $37.20 per week (6.1 percent more). Minorities overall would have earned $173.20 per week (25.5 percent more). 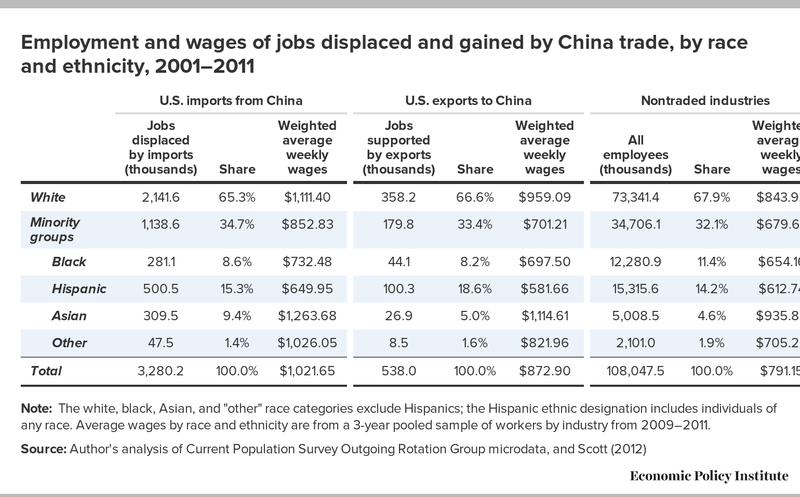 Thus, the growth of imports from China between 2001 and 2011 displaced over 1.1 million jobs (Table 7, row 2) that would have gone to minorities (more than one third, or 34.7 percent of the nearly 3.3 million jobs displaced by imports), and that would have paid excellent wages and benefits. The number of black and other minority jobs displaced was 2.6 percentage points above the average labor force shares of these groups in nontrade industries (data columns 2 and 8 in Table 7). Thus, more than 1.1 million minorities who were displaced suffered a tremendous loss of income and benefits due to the growth of imports from China in this period. The growth of exports to China supported a much smaller number of jobs for minority groups, as shown in the middle three columns in Table 7. Those jobs offered smaller wage premiums than jobs displaced in import-competing industries, as noted above. For black workers, the export wage premium relative to nontraded industries (column 6 minus column 9) was $43.34 (6.6 percent). Hispanic workers were actually paid $31.09 per week less in exporting industries than in nontraded industries. This reflects, in part, the fact that more than one-third of Hispanic workers supported by exports worked in agricultural industries, where wages are exceedingly low. Export wage premiums were highest for Asians at $178.73 per week (19.1 percent more than in nontraded industries), followed by other minorities ($116.76 or 16.6 percent more), and whites ($115.17 per week or 13.6 percent more). Export wage premiums for most groups were only one-half to one-third of the level observed in import-competing industries, or less. In addition, the total number of minority jobs supported by exports was only 179,800, less than one-sixth of the number of minority jobs displaced by imports. 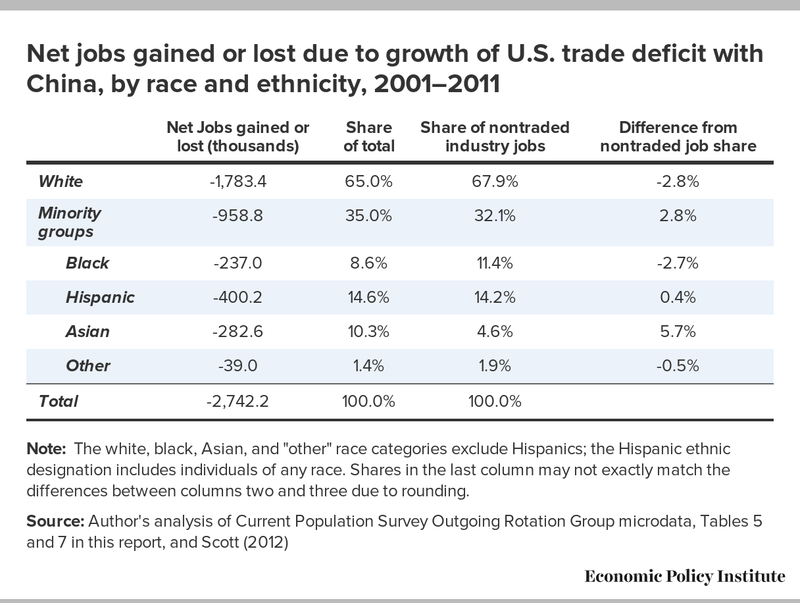 The data in Table 7 can also be used to estimate the net employment effects of trade by race and ethnicity. Net jobs displaced by trade are equal to the number of jobs supported by exports (column 4), less jobs displaced by imports (column 1). 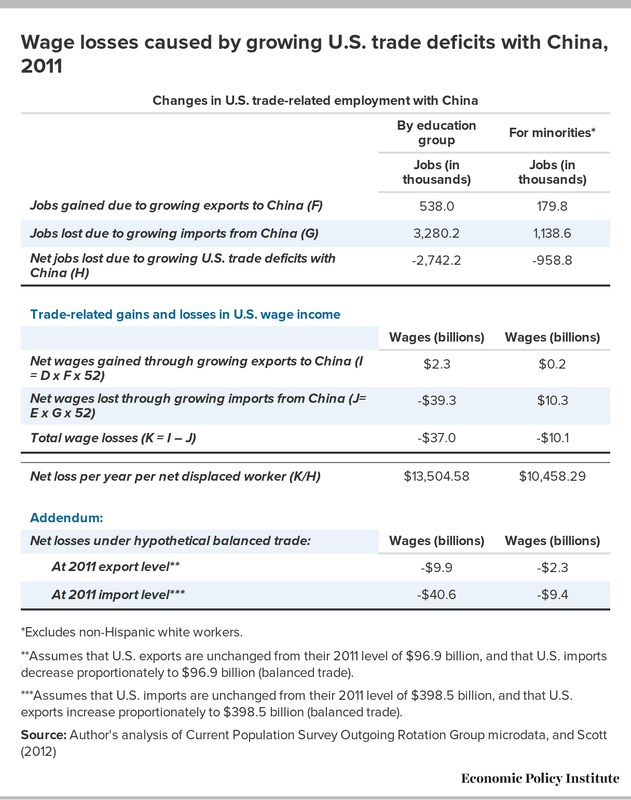 These totals are shown in column 1 of Table 8, which shows that growing U.S. trade deficits with China between 2001 and 2011 displaced a disproportionately large number of good jobs for minority workers. Overall, growing trade deficits with China between 2001 and 2011 displaced 958,800 jobs for minority workers. This was 35.0 percent of the total jobs displaced, 2.8 percentage points more than the minority share of the nontraded sectors of the economy. Note: The white, black, Asian, and "other" race categories exclude Hispanics; the Hispanic ethnic designation includes individuals of any race. Shares in the last column may not exactly match the differences between columns two and three due to rounding. Growing U.S. trade deficits with China between 2001 and 2011 displaced a disproportionately large number of good jobs for minority workers. Thus, growing trade deficits displaced nearly one million good jobs with excellent benefits for minority workers between 2001 and 2011. This contributed to the growing gulf between wages earned by white workers and minority workers, and the general rise in income inequality in the United States. Having estimated the direct effects of trade on workers by education and race and ethnicity, we can now turn to developing estimates of the total national wage impacts of growing U.S. trade deficits with China in 2011. As shown in Tables 6, 7, and 8, the growth of trade deficits with China shifts U.S. jobs from better-paid traded-goods industries into jobs in nontraded sectors where wages are significantly lower on average. Moreover, average wages in import-competing industries are higher than those in export industries. Thus, the growth in the overall volume of trade (imports plus exports) with China substituted lower-paying export jobs for higher-paying jobs in import-competing industries. This somewhat surprising finding stands economic logic on its head. Economic theory would suggest that the United States should specialize in producing goods that use high-skilled, highly educated (and highly paid) workers, and import labor-intensive goods that use more low-skilled labor. In fact, low-wage commodity sectors were some of the largest exporters of goods from the United States to China. This section analyzes the effects of changing trade flows with China on wages and the worker characteristics of those affected by growing trade deficits. This analysis is based on a pooled sample of 2009 to 2011 data from the Current Population Survey, as described and summarized above. The results of the wage analysis are summarized in Table 9A. 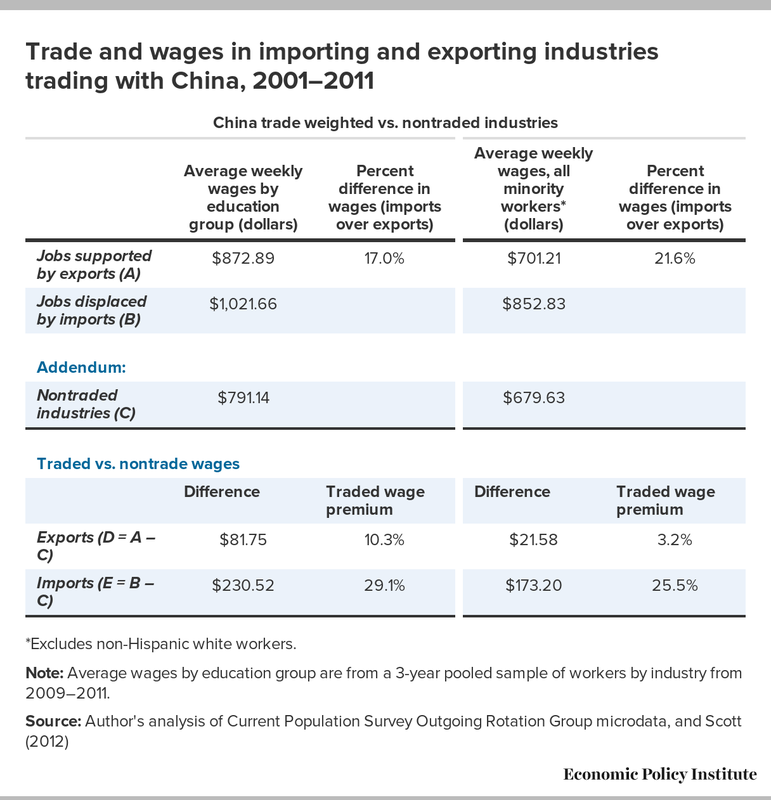 The first column shows average weekly wages in import and export industries by education group (from Table 6) in the 2009–2011 period, and the second column compares the percent difference between import and export wages for U.S. trade with China. One of the most important findings in this study is that, for trade with China (by education group), average wages in exporting industries, at $872.89 per week, were lower than in import-competing industries, where they were $1,021.66 per week—a premium of 17.0 percent. The estimated difference between weekly import and export wages shown in the first column of Table 9a assume that trade only affects the composition of employment between industries, and that it does not change the distribution of employment within industries. If production work employing a higher share of noncollege educated workers has been displaced within manufacturing industries, then the wage loss estimates in Table 9A are an upper-bound estimate of trade-related wage losses shown in Table 9B, below. However, the losses are still large, as indicated by two wage comparisons. First, it is unambiguously true that, for all workers by education group (data columns 1 and 2) wages in nontraded industries are at least $81.75 per week less than in exporting or importing industries. Second, education-weighted weekly wages in nontrade industries ($791.14) are also substantially less—$145.56 less—than average weekly manufacturing wages ($936.70 according to Table 1), and more than three-fourths of jobs displaced in China trade were in manufacturing. The third and fourth columns of Table 9A report average wages for traded and nontraded industries based on China trade weights, for minority workers only (excluding white workers). For minority workers, wages in nontraded industries ($679.63) are less than in exporting or importing industries. Import wages also exceed export wages in this breakdown by 21.6 percent, as shown in column four. These estimates of trade-related wages by education and for minorities are used in the remainder of Table 9 to develop a range of estimates of net wages lost due to growing trade deficits with China. The growth of U.S. trade deficits with China implies that, even if reemployed, more workers were employed in other, nontraded sectors of the economy than would have been if U.S. trade with China were balanced, and that total payments to affected workers were lower than they would otherwise have been for two reasons. First, as trade expanded, jobs displaced by imports paid more than export jobs paid, so U.S. workers lost wages on every job gained through increased exports. Second, the growth in the trade deficit reduced the demand for labor in traded goods industries and, even when reemployed, those workers earned much lower wages than they would have earned if employed in manufacturing and other traded-goods industries. The estimates developed in Table 9 are conservative because they assume that workers displaced by growing U.S.-China trade deficits are reemployed. However, since December 2007, the United States has lost 1.8 million manufacturing jobs, and 2.1 million total public- and private-sector jobs (Bureau of Labor Statistics 2013a). Worse yet, four years into the so-called recovery, the United States still has a shortfall of 8.3 million jobs needed to absorb new entrants to the labor force and return unemployment to its prerecession level of 5.0 percent in December 2007 (Economic Policy Institute 2013). Total wage gains and losses for all trade-affected jobs (assuming that workers are reemployed) are estimated in Table 9B. The jobs gained due to growing exports, jobs lost due to growing imports, and net jobs lost between 2001 and 2011 are shown in the top section of the table. The first column reports trade-related wage gains and losses by education group. The growth of exports to China generated total wage premiums (over nontraded industry jobs) of $2.3 billion in this period (i.e., $81.75 per job per week from Table 9A, times 538,000 export jobs gained from Table 5, times 52 weeks), while the growth of imports eliminated wage premiums of $39.3 billion in this period using calculations from the same two tables). Thus, there was a nationwide loss of $37.0 billion in wage premiums that would have been earned had the U.S. trade deficit with China not increased. Each full-time worker of the 2.7 million displaced by the growing trade deficit (the “net” increase in imports from China), even when reemployed in nontraded industries, lost an average $13,505 per worker per year ($37.0 billion divided by 2,742,200 net jobs displaced). **Assumes that U.S. exports are unchanged from their 2011 level of $96.9 billion, and that U.S. imports decrease proportionately to $96.9 billion (balanced trade). ***Assumes that U.S. imports are unchanged from their 2011 level of $398.5 billion, and that U.S. exports increase proportionately to $398.5 billion (balanced trade). This wage loss figure is a snapshot of how much more workers displaced between 2001 and 2011 by the growing U.S. trade deficit with China would have earned in 2011 had they not been displaced. Annual wage losses will increase if the U.S. trade deficit with China increases, as it did in 2012 (U.S. International Trade Commission 2013). Even if trade were balanced, U.S. workers would still lose because we export low-wage products to China and import high-wage products, as shown in column 1 of the addendum to Table 9B. For example, under a hypothetical scenario where U.S. exports to and imports from China were each $96.9 billion (the actual value of U.S. exports to China in 2011) but the pattern (in terms of wages of jobs lost and gained) is as described here, the United States loses $9.9 billion. The loss reflects the difference between wages earned in making $96.9 billion in exports, and wages lost in jobs displaced by imports, if those workers are reemployed in nontraded industries earning $791.14 per week. If exports and imports were $398.5 billion (the actual value of U.S. imports from China in 2011) then the loss is more than four times as much—$40.6 billion. These losses offset some of the gains from trade with China (from specialization in products for which the United States has a comparative advantage) that are found in most economic models of the benefits of trade. The right-hand columns in Tables 9A and 9B examine the costs of growing U.S.-China trade deficits between 2001 and 2011 for the 958,800 minority workers whose jobs were displaced. Average wage premiums for both minority jobs supported by exports to China and jobs displaced by imports are lower than they were for workers overall (by education), which reflects the disparity in wages by race observed in Table 7. For minority workers, wage premiums earned on exports were $701.21 per week (Table 9A, column 3 vs. $872.89 per week in the education analysis, shown in column 1). Wage premiums associated with jobs displaced by growing imports were $852.83 per week in the minority group analysis (Table 9A, column 3), compared with $1,021.66 per week in the education analysis covering all workers (column 1). However, the baseline level of wages in nontraded industries was also only $679.63 in the minority group analysis, $111.51 (14.1 percent) less than in the overall education group analysis. The only significant difference between the populations considered in columns 1 and 3 is the exclusion of white, non-Hispanic workers from column three; white workers represented 67.9 percent of the labor force in nontraded industries, and slightly smaller shares in the traded goods sectors (Table 7). Growing trade deficits with China were enormously costly for both minority workers and for all 2.7 million workers displaced between 2001 and 2011. In summary, even when reemployed in nontraded industries, the 2.7 million workers displaced by growing U.S. trade deficits with China lost $13,505 per worker in 2011, alone. Minorities also suffered large trade-related wage losses of $10,485 per worker in 2011. But lost jobs and lower wages for displaced workers are just the tip of the iceberg. Competition with low-wage workers from less-developed countries has also driven down wages for workers in U.S. manufacturing and reduced the wages and bargaining power of similar workers throughout the economy—essentially all production workers with less than a four-year college degree, or 70 percent of the private-sector workforce (roughly 100 million workers). For a typical full-time, full-year worker earning the average wage in 2011, these indirect losses totaled approximately $1,800 per year (Bivens 2013, 1). China is the most important source of downward wage pressure from trade with less-developed countries, because its workers receive very low wages, and because it was responsible for over half (51.6 percent) of the growth in U.S. imports of manufactured goods from less-developed countries between 1995 and 2011 (Bivens 2013, 7). The models used in this study also allow an examination of the effects of growing U.S.-China trade deficits on different demographic groups in terms of education, wage distribution, and race. Workers with a high school degree or less education have been particularly hard hit by the rising U.S. trade deficit with China. 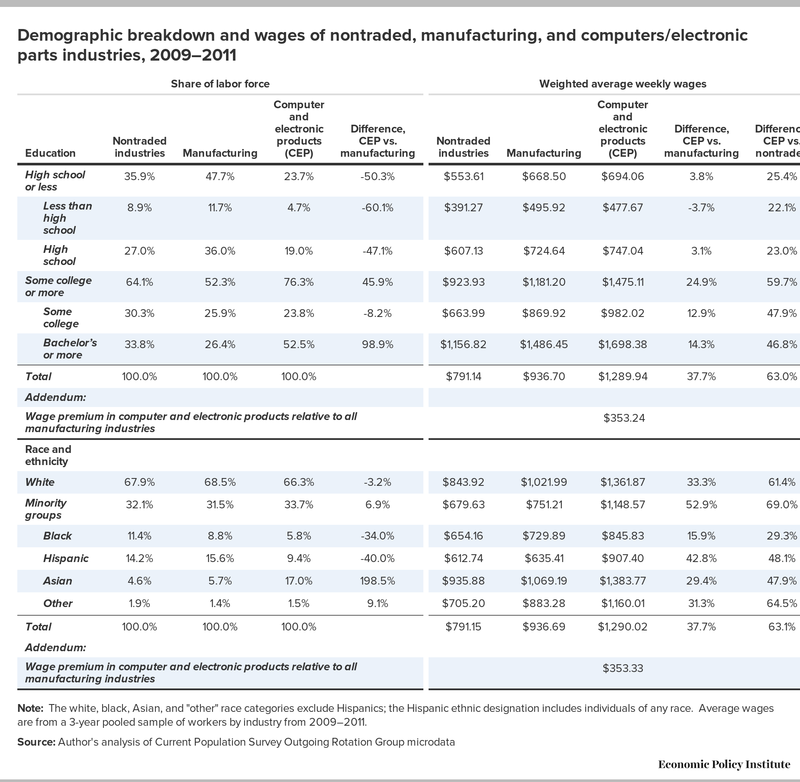 The manufacturing sector, which produces most traded goods, employs a much higher-than-average share of such workers, as shown in Table 10, which details shares of workers and their wages by education level and race/ethnicity for all industries (i.e., all 123 million workers in the sample), manufacturing, and computer and electronic products. Workers with a high school degree or less education made up 35.9 percent of workers in nontraded industries in 2009–2011, but they made up 47.7 percent of the manufacturing labor force. 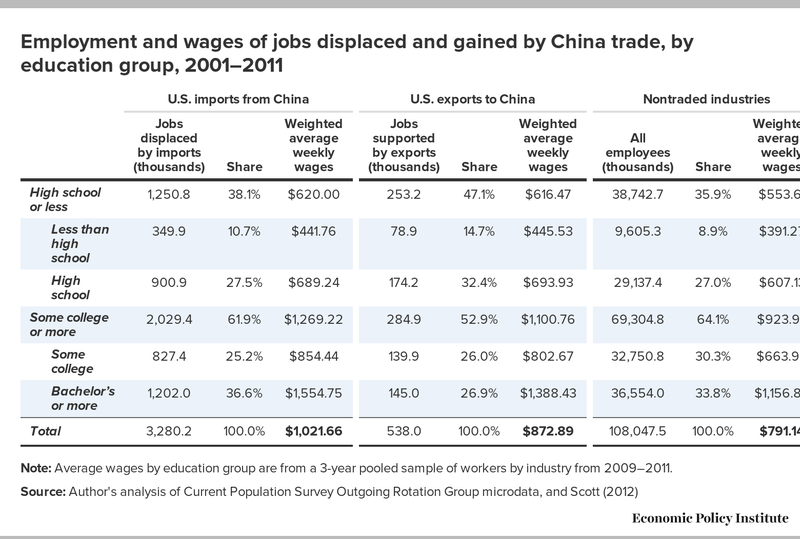 Of the 2.7 million jobs displaced by China trade between 2001 and 2011, more than 2.1 million or 76.9 percent were in manufacturing (Scott 2012, Table 3 at 15). Within manufacturing, nearly 1.1 million (1,064,800) jobs were displaced in computer and electronic products, over half of all manufacturing jobs displaced, and 38.8 percent of all jobs displaced due to the growth of U.S. trade deficits with China in this period.20 Thus, the pattern of trade-related job losses fell most heavily on manufacturing, and was skewed towards the computer and electronic products industry. Although manufacturing overall does support a large number of good jobs for workers with a high school degree or less education (47.7 percent, as cited above), that is not true for the computer and electronic products industry, where only 23.7 percent of workers have no education beyond high school. As noted earlier, manufacturing workers do earn a substantial wage premium at every level of education, as shown in Table 10. Within manufacturing, the computer and electronic products industry pays substantially more than the manufacturing average for workers with at least some college education, who earn a premium of 12.9 percent over other manufacturing workers, and workers with a bachelor’s degree or more education, who earn a 14.3 percent premium. However, the wage advantage of jobs in this sector declines sharply with lower education levels, and workers with less than a high school degree actually earned less in computer and electronic products than in manufacturing. Overall, workers in computer and electronic products earned a substantial, weighted average wage premium of $353.24 per week (37.7 percent) above other manufacturing workers, by education group, as shown in Table 10 (column 7 minus column 6). This is a result of both the much higher average level of education of computer and electronic products workers, and the wage premium these workers enjoyed. Although not shown in the table, well over three-fourths (81.1 percent) of the jobs displaced in computer and electronic products by growing China trade deficits required some college or more education. The loss of over one million education-intensive computer and electronic products jobs due to growing trade deficits with China resulted in massive wage losses to workers in this industry. Using the formulas developed for Table 9, growing U.S.-China trade deficits in the computer and electronic products industry alone resulted in the loss of $33.2 billion in wages to workers in this industry alone in 2011, 89.8 percent of the net trade-related wage loss of $37.0 billion shown in column 1 of Table 9B. When analyzed by race and ethnicity (the bottom half of Table 10), trade-related job and wage losses, especially in computer and electronic products, were even more costly than those shown in the education premium analysis. Every racial and ethnic group in the table earned substantial wage premiums in the computer and electronic products industry, ranging from 15.9 percent for black workers to 33.3 percent for white workers to 42.8 percent for Hispanics, relative to average manufacturing wages. The average wage premium for all workers in this industry was 37.7 percent, which exceeded the 33.3 percent average for white workers. Significantly, the average premium for minority workers was 52.9 percent, which far exceeded the average for white workers. 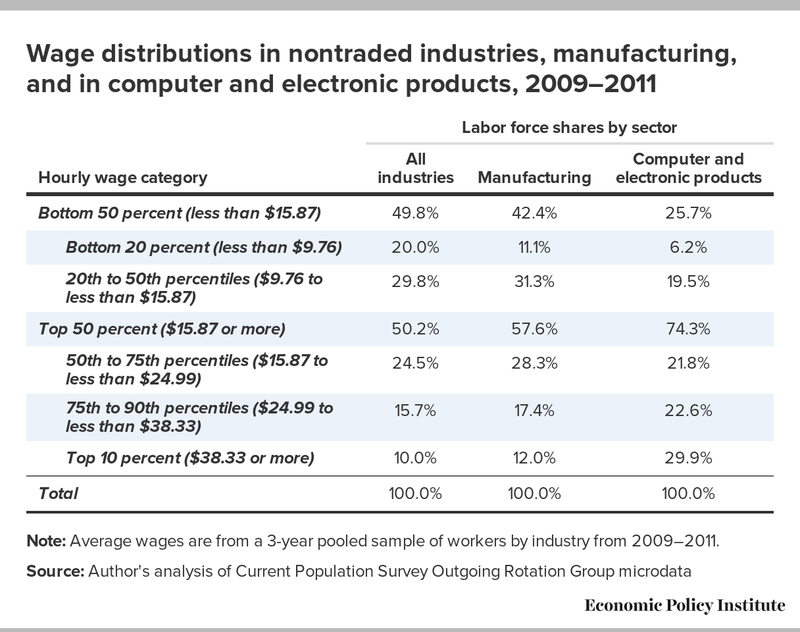 For minority workers, the wage premiums available in the computer and electronic products industry paid much more than jobs in nontraded industries. For example, blacks in this industry earned 29.3 percent more and Asians earned 47.9 percent more than workers of the same race/ethnicity in nontraded goods industries, Hispanics earned 48.1 percent more, and the average wage of all minority workers in the computer and electronic products industry was 69.0 percent higher than the average wage of all minority workers in nontraded industries. These results would appear to reflect the high wage premiums available to the 76.3 percent of workers in this industry who possessed at least some college education. These results show that for minority workers with some college education, or more, the computer and electronic products industry offers tremendous opportunities, and is relatively devoid of the revealed patterns of wage discrimination found in other parts of the manufacturing sector (Tables 2 and 3). Furthermore, a disproportionately large share (34.7 percent) of the jobs displaced in computer and electronic products were held by minority workers.21 These workers made up only 32.2 percent of total employment in all industries between 2009 and 2011 (Table 2). Growing trade deficits with China displaced some of the best jobs in the country for a disproportionately large number of minority workers with at least some college education. In sum, the hopes for a better life of more than 369,000 minority workers were dashed by growing trade deficits. Growing trade deficits with China displaced some of the best jobs in the country for a disproportionately large number of minority workers with at least some college education. In sum, the hopes for a better life of more than 369,000 minority workers were dashed by growing trade deficits. Manufacturing and trade-related jobs also pay well. Table 11 breaks down wages into five broad categories by hourly wage. In the bottom half of the wage distribution are jobs paying less than $9.76 per hour (representing roughly the bottom 20 percent of the labor force) and jobs paying $9.76 to less than $15.87 per hour (representing the 20th to 50th percentiles). In the top half of all jobs (or the best-paying jobs in the U.S. labor market) are those paying $15.87 to less than $24.99 (the 50th to 75th percentiles), $24.99 to less than $38.33 per hour (the 75th to 90th percentiles) and the top decile, where wages are $38.33 per hour and above. Note that substantially more than half of the jobs in manufacturing (57.6 percent) were in this top half of the wage distribution, and the manufacturing share in each of the top four categories exceeded the national average. Thus, combining this analysis with earlier analyses by education level, manufacturing provided more good jobs for more workers with a high school degree or less education than did the other sectors of the economy as a whole. Note: Average wages are from a 3-year pooled sample of workers by industry from 2009–2011. The computer and electronic products industry stands out for other reasons. The computer and electronic products industry lost 1,064,800 jobs, 38.8 percent of all jobs displaced due to growing trade deficits, as noted above, and college graduates make up a much larger share of computer and electronic products workers (52.5 percent) than their share of manufacturing (26.4 percent) or other nontraded industries (33.8 percent). As a result, the computer and electronic products industry has many more workers in the top wage half (74.3 percent) and top wage decile (29.9 percent) compared with the economy overall. These results help explain the relatively high wages earned by all racial and ethnic groups in computer and electronic products, shown in the bottom half of Table 10. The increase in the U.S. trade deficit with China between 2001 and 2011 eliminated 2.7 million U.S. jobs, over 2.1 million (76.9 percent) of which were in manufacturing. This paper shows that net job displacement has cost the economy $37.0 billion in lost wages 2011 alone, with $10.1 billion of those losses borne by minority workers. The displacement of manufacturing jobs by growing trade deficits with China has been especially costly for the economy. Workers with a high school degree or less education and racial and ethnic minorities have been particularly hard hit by growing trade deficits with China. These factors have contributed to the massive wage and income losses caused by growing China trade deficits. Growing trade deficits with China have been especially costly to manufacturing industries and their employees. Manufacturing plays a number of key roles in the economy. It offers good wages and excellent benefits to a larger share of workers with less than a college degree than the rest of the economy. Manufacturing also provides good jobs with excellent wages and benefits for minorities. Simultaneously, manufacturing employs more than twice as many scientists and engineers, as a share of manufacturing employment, as the rest of the economy. Manufacturing is also responsible for about two-thirds of private-sector research and development. Growing U.S. trade deficits with China had a disproportionately large impact on minority workers; between 2001 and 2011, 958,800 good jobs with excellent benefits for minority workers were displaced (35.0 percent of total jobs displaced). This is disproportionately large share of the labor force (2.8 percentage points greater than their share of employment in nontraded industries). For minority workers, the jobs displaced by imports paid 6.1 percent more for Hispanics than jobs in nontraded goods industries, 12.0 more for blacks, 35.0 percent for Asians, 45.5 percent more for other minority workers, and 25.5 percent for all minority workers. Growing U.S. trade deficits with China also displaced nearly 1 million (997,700) good jobs with excellent benefits for workers without any college education, (36.4 percent of total jobs displaced, and 0.5 percentage points more than their share of the nontraded labor force). In addition, workers with a bachelor’s degree or more education lost 1.057 million jobs, 4.7 percentage points more than their share of the nontraded labor force. Thus growing China trade deficits displaced disproportionately large numbers of workers at both the top and the bottom of the educational ladder. The growth in U.S. trade deficits with China is due, in large part, to China’s currency manipulation and other trade-distorting practices, including extensive subsidies, illegal trade barriers, dumping, and suppression of wages and labor rights. China needs to rebalance its economy by becoming less dependent on exports and more dependent on domestic demand led by higher wages and infrastructure spending. And it must adhere to international rules of the road regarding currency manipulation, trade and industrial policies, and respect for fundamental labor and human rights. The U.S.-China trade relationship must be fundamentally changed. Addressing the exchange rate policies and labor standards issues in the Chinese economy are important first steps. It is time for the administration to respond to the growing chorus of calls from economists, workers, businesses, and Congress and take action to stop illegal currency manipulation and labor rights violations by China. –The author thanks Josh Bivens, Michael Wessel, Mark Anderson, and Steven Capozolla for comments and William Kimball for research assistance. –This research was made possible by support from the Alliance for American Manufacturing. Krugman, Paul, and Maurice Obstfeld. 1991. International Economics: Theory and Policy. New York: Harper Collins Publishers Inc.
Stolper, Wolfgang, and Paul Samuelson. 1941. “Protection and Real Wages.” Review of Economic Studies, vol. 9, 58–73. 1. This sector includes computers and peripheral equipment; communications, audio, and video equipment; navigational, measuring, electro-medical, and control instruments; semiconductors and other electronic components; and magnetic and storage media (Scott 2012, Table 3, 15). 2. This reflects pressures for “factor price equalization” (Krugman and Obstfeld 1991, 79–80) and the observation that changes in traded goods prices may have a very strong impact on the prices of labor and other factors of production (Stolper and Samuelson 1941, as cited by Krugman and Obstfeld 1991, 74 at n. 2). 3. As the table notes specify, in these data, race and ethnicity are presented in mutually exclusive categories: The white, black, Asian, and “other” race categories exclude Hispanics; the Hispanic ethnic designation includes individuals of any race. 4. Employment and wage data reported in Tables 1 and 2 come from a dataset derived from the Current Population Survey Outgoing Rotation Group microdata covering the years 2009 through 2011. The data cover workers age 16 and older employed in both the public and private sectors, with some exceptions. The largest excluded group is members of the armed forces and private households. In addition, several small, miscellaneous sectors that could not be matched to Bureau of Labor Statistics’ industries in Scott 2012 were also excluded, including the not-specified mining industries, electric and gas combinations, not-specified utilities, and not-specified metal industries. 5. Data on the numbers of workers with some college education were not available from the source consulted (U.S. Census Bureau 2012). 6. Austin, Hamilton, and Darity (2011) examined the causes of racial disparities in wages. They found that that black men are overrepresented in low wage jobs and underrepresented in high wage jobs, and concluded that labor market discrimination excludes many black men from high-wage jobs. 7. Social returns are a measure of the total financial value of an investment, including environmental and social benefits and returns not captured by the initial investor, such as benefits captured by other firms, workers and communities, as well as returns to the innovator. 8. Bureau of Economic Analysis (2012) and author’s analysis. 9. Author’s analysis of Current Population Survey Outgoing Rotation Group microdata. 10. U.S. International Trade Commission (2013), Bureau of Economic Analysis (2013), and author’s analysis. 11. A third critical international event was the North American Free Trade Agreement (NAFTA) in 1994, which lead to the rapid growth of U.S. job displacement due to growing trade deficits with Mexico (Scott 2011). 12. Beginning in 2002, the dollar declined more than 30 percent against several major currencies such as the euro and the Canadian dollar. However, yuan appreciation was largely delayed until late 2007 and 2008—too little to be of any help in slowing the U.S.-China trade gap to date. The appreciation of the yuan has had little effect on the prices of U.S. imports from China, which rose only 2.5 percent between July 2005 (when the yuan was first adjusted) and May 2008, much less than the 19 percent appreciation of the yuan in that period (Congressional Budget Office 2008, 2). Furthermore, given the continuing rapid growth in manufacturing labor productivity in China relative to the United States and other developed countries, there must be trend appreciation in the yuan for China to simply maintain its global trade surplus, as noted by Gagnon (2012, 3, note 2). 13. The analysis in Scott (2012, Table 1) is based on domestic exports (reproduced in Table 5 in this report), and excludes re-exports—which are goods produced in other countries, imported into the United States, and then re-exported to China. Since re-exports are not produced domestically, their production does not support domestic employment, and they are excluded from the model. 15. The employment impacts of China trade were estimated using a U.S. Bureau of Labor Statistics model with 195 industries (Scott 2012). Those 195 industries were condensed to 45 corresponding supersectors for analysis of wages by race and ethnicity in the author’s analysis of Current Population Survey Outgoing Rotation Group microdata. 16. Scrap and second-hand goods were responsible for 13.2 percent of the growth of U.S. exports to China between 2001 and 2011 (Scott 2012, Table 2 and page 13). These exports supported no jobs according to the BLS model used in our study (Scott 2012, Table 3 and page 16). The importance of exports of scrap and second-hand goods in U.S. exports to China reinforces our finding that exports to China do not support high-wage or highly educated jobs in the United States. 17. Of the total 2.7 million jobs displaced by growing U.S. trade deficits with China between 2001 and 2011 (Table 5), 1,065,800 (38.8 percent) were in computer and electronic products industries (Scott 2012, Table 3 at pp. 15–16). 18. The model estimates jobs supported by trade in all 45 industries, including manufacturing, commodity, and service industries. About 76.9 percent of the jobs displaced by growing trade deficits with China were in manufacturing (Scott 2012, Table 3). Thus there is some overlap between import, export, and “nontraded” jobs, but the vast majority of nontraded jobs are not supported or displaced by China trade. 19. The data in Table 6 can also be used to calculate the net jobs created or lost due to growing trade deficits with China that would be similar to Table 8. The results are: less than high school, 271,000 jobs lost (9.9 percent of total jobs displaced); high school, 727,000 jobs lost (26.5 percent of the jobs displaced); some college, 688,000 jobs lost (25.1 percent of the jobs displaced); and bachelor’s degree or more education (BA+), 1,057,000 jobs displaced (38.5 percent of jobs displaced). Only workers with less than a high school degree (+ 1.0 percent) and BA+ workers (plus 4.7 per cent) suffered disproportionately large losses relative to losses in nontraded industries. Unlike manufacturing as a whole, the net jobs displaced did not disproportionately hurt all workers with less than a high school degree. This reflects the large number of jobs displaced from the computer and electronic products industry, which employs a disproportionately large share of BA+ workers, as discussed below. 20. Computer and electronic products includes computer and peripheral equipment; communication, audio and video equipment; navigational, measuring, electro-medical, and control instruments; semiconductors and other electronic components; and magnetic and optical media production. 21. Unpublished industry data from the study, available on request from the author.